Following completion of high school and college in PA., I journeyed west and settled in Jackson in 1976. Since then, I have been actively engaged in several small business ventures, most currently Wilson Hardware and the Stagecoach Bar. Favorite Race/Ride: Anywhere in Italy!! The food, culture, and respectful attitude toward cyclists is not to be missed. The Dolomites are my favorite. Completion of the Pyrenees C2C route, cycling from the Atlantic Ocean to the Mediterranean Sea traversing the high passes of the Pyrenees for their entire length. Lots of days suffering on a bike. One that sticks to mind is a hypothermia-inducing descent in a driving rain off a mountain pass in Cataluña. The rain was so intense that I had the feeling of being water boarded as I sucked in the water from the air and front wheel spray. Work, family, back country ski in winter, travel. Serve on the Boards of the Jackson Hole Community School, InterConnections 21, and Team Jackson Hole. 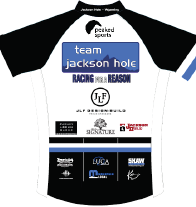 Support the team by ordering Team Jackson Hole cycling clothing like jerseys, shorts, jackets, vests, and more. Learn more here. Learn more about the 2014 Team Jackson Hole non profit Hole Food Rescue here.